It's been a while since I posted something I made in my wok, hasn't it? 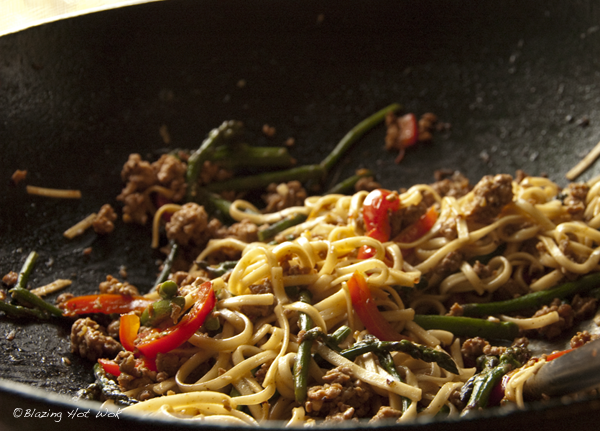 Well, here you go— stir-fried udon noodles with pork and asparagus. The ingredients are easy to find and dinner can be on the table in 30 to 45 minutes, depending on how efficient you are in the kitchen. Oh, and did I mention it tastes good? Even the kid ate it without complaining, which says a lot when we're talking about asparagus and bell peppers. Prepare the sauce by combining the oyster sauce, 1 tbs soy sauce and hoisin, rice whine and sugar. Stir to dissolve the sugar. Set aside until needed. Heat your wok over high heat until it is blazing hot. Add about 2 to 3 tbs peanut or vegetable oil. (No olive oil! It's not suitable for high heat cooking.) Immediately add the garlic, ginger and chili-garlic sauce. Stir to prevent them from burning. After about 30 seconds, add the meat and stir quickly and constantly. When the meat is just browned, remove it to a bowl. Add more oil if necessary and add the bell pepper and asparagus. Stir-fry for a minute or two. Remove the vegetables to the same bowl as the meat. Add the cold noodles to the wok. Quickly move the noodles around to prevent sticking. Turn down the heat if necessary. After a couple of minutes, add the meat and vegetables back into the wok followed by the sauce. Quickly toss the noodles in the sauce. Taste and adjust seasoning with soy sauce or hoisin, if necessary. Serve immediately. *I like to grind the pork or chicken thighs myself because I find that pre-ground meat tends to be a bit wet. You don't need a meat grinder. Simply use a food processor or do it by hand. It really doesn't take long. **I prefer the Rooster Brand chili-garlic sauce. It's much spicier than Lee Kum Kee Brand. Either will work just fine.